A society can last only if it has a steady source of energy and a means to keep the members of that society safe. Likewise, an organism is best prepared to not die if it is inclined to search for energy sources and has some means of keeping the parts of it safe. The first line of defense in an organism is the membrane around the outside. This membrane can refer to a single celled organism or the skin on your body. Your skin is your largest organ and it functions mainly to keep stuff from getting inside of you. If an invader does find its way past the first barrier, the body has a few methods of neutralizing the problem. Usually the invader will enter the system through an orifice or through a cut in the skin. If there is damage done to cells, like when they are split apart, nearby neurons signal pain to request an allocation of blood to help with defense. Blood will rush to the area causing redness, swelling, and heat; pain is the last of the four Cardinal Signs of an infection. The blood contains specific types of blood cells that can eat smaller invaders, others that recognize and block invaders, and pieces of blood cells that stick together in order to patch up any opening in the skin. If the invasion continues after this step, the body will go into panic mode and increase the overall temperature in the hopes that the increased temperature will denature (destroy) the proteins of the invader. This increase in temperature is known to us as a fever and it is the last thing that our bodies will do when it has no idea what else to do. Let’s talk more about the different types of blood cells rushing to the site of an infection. The cells that recognize an invader and signal for a specific defense are called T cells. AIDS is such a harmful disease because it kills T cells so fewer can signal for help to come kill an invader. Another cell, called a B cell, secretes Y shaped proteins that we call antibodies; you can think of these antibodies like an archer’s arrows. B cells and T cells work together to recognize and block invaders. Every cell has receptor proteins in its membrane that allow it to latch onto other cells. B cells “shoot” their antibodies into those proteins in order to plug up the invading cell. With all its receptor proteins full, the invader cannot do any damage to your cells. Larger cells called macrophages or “white blood cells” will eat the plugged up invaders. The macrophages will eventually die and you release them as pus, this is why that white stuff comes out when you pop a pimple! If the infection did not occur at the surface of the skin, the dead and full white blood cells will have to be collected elsewhere. 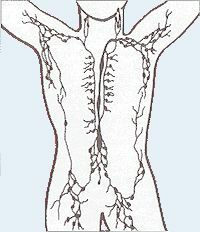 At various points in your body, you have web-like structures that are good at catching stuff that shouldn’t stay in the blood. We call these structures lymph nodes and if they collect enough trash, they will swell. This is why your doctor checks your neck and armpits if you say you’re feeling sick. After all the action, the T cells will store the invader’s identity in order to more easily combat it the next time. The process of killing and remembering invaders is what we call immunity and it is the reason that vaccines work. Vaccinations put a weakened form of the invader directly into your body so that your defense cells can have an easy practice round and remember it if it ever comes back. As I mentioned earlier, all cells have receptor proteins within their membranes and your cells all have a unique protein that marks them as yours, we call them marker proteins. Your T cells can patrol the body within the blood and quickly identify if any cells are not yours. When a virus enters your body, it will actually land on your cell and hijack the cell’s protein manufacturing center in order to construct more viruses. Your body cannot quickly tell these cells apart but they do have a method of marking them for destruction if the virus is confirmed. Cancer is the name we use when your cells no longer have control over when they divide. This can quickly become problematic since a large mass of excess cells, called a tumor, will pull a lot of resources. Because the they are your cells, your defense system can’t tell that anything bad is happening. Your T cells just see a bunch of your own cells and move on, business as usual. Your body has adapted and developed a method of identifying and destroying almost any invader that can enter your body. Some invaders require the help of modern medicine to give your defense an extra boost. It is important to realize that, just like with your muscles, your defense system strengthens with use. This is not to say that you should go try to get sick. Rather, it is a warning for the near sterile society that we have built. Creating a world filled with antibiotics and hand-sanitizer has reduced the amount of potential invaders but it also means that only the strongest invaders will survive. They will evolve their own immunity to our manufactured defenses. A cleaner world means your immune system is less practiced when an invader does finally break through your external defense. Keep yourself clean, but be aware of the trade-offs of staying too clean.